That wasn’t mentioned in the manual – but there it is, a generous, part mopped-up offering smack bang in the middle of the corridor to the canteen. It’s a carpeted corridor too, a nice light beige carpet. It’s not clear whether the person cleaning up ran out of absorbent paper, patience, or stomach for the job. But as I carefully step around the remains it’s a stark reminder that someone is having a worse ride than me. I later heard about some kind of fertilizer or pesticide spray poisoning affecting riders, of which this was perhaps a result. Sitting there, looking a little lost and forlorn is possibly the most welcome sight I have seen for hours (aside from Pieter and Andrew waiting). T is slumped in a chair having already eaten, but decided to wait up for me. I am hugely grateful, and our conversation flows as I painstakingly try and swallow some food. It’s tasty pasta, but my body just does not want to eat and it takes forever to get the plateful down. “You’re not kidding” I replied. “If it hadn’t been for these guys, I might have just given up” I said, nodding towards Pieter and Andrew. Several of the other riders have now started to comment on Andrew’s impressive mud spattering, which covers a large part of his lower body. We sit and chat as I chew slowly and drink Rooibos. Gradually a plan emerges. We can leave by 6am, which keeps us 6 hours ahead of cutoff, but carves out time for a short nap to recharge. I’m not totally sure it’ll be enough – even with a rest and some food inside I feel utterly wrecked. But experience of long rides teaches you not to make decisions in the night when tired, but in the morning after a sleep. It takes us several attempts to find a bed – each of the houses opposite that is supposed to have spaces is full. Riders have just crashed without checking in first. It’s frustrating and erodes valuable minutes from our sleeping time. Eventually though, we are rewarded with a completely empty unit. We skip the beds by the door in case of late arrivals, and grab a room at the back to avoid disturbance. My pre-sleep ritual is minimal – contact lenses out, devices on charge, teeth brushed, alarm set, sleep (which comes near instantly). One hour and twenty minutes later, a thin grey light streams through the window as an unwelcome alarm drags us both back to conciousness. It’s such a ridiculously short sleep that anyone who has not done this style of race will wonder what an earth possible value it serves. And true, later today, the lack of a proper sleep added to a second tough day of riding is bound to become a factor. But for now, both of us are transformed from the exhausted, shabby ghosts that collapsed onto these mattresses. Buoyant wouldn’t be an overstatement to describe our moods. T has a shower, whereas I’m content with a healthily proportioned ablute (after T has finished of course), a splash of water to the face, and a brush of my teeth. I make my way back to the RV a few moments before T, hoping to scout out a coffee before we ride out. Nobody said anything about breakfast. But there it is, plain as day written on the token I’m holding. I could have kissed the staff member who handed it to me. Except I’m dirty, and stinky, and my lips are already chapped. I grab one for T, and am already almost done eating mine and on my second cup of coffee by the time his smiling face appears. He’s also delighted at the unexpected bounty before we start out again. The RV sheet reads just before 6am as we sign out. Pretty much on schedule, and still with a handful of riders behind us. Neither the stiff breeze nor the uphill into the nature reserve at the end of town can dampen our spirits. The early dawn light spreading out across the bosveld is too delightful for any chance of that, plus once over the crest it’s easy downhill and flat riding. Other riders spotted Gemsbok and various other game across this stretch. I must have been too focused on the trail. More than once the wonder of the scenery we are riding through strikes me, but I didn’t see so much as a mouse myself. One section of route leading towards the exit pitched downwards on a twisting, loose track. But beyond that it was easy, flowing riding along the fence to the gate. As we stopped to shed layers and put on sun cream a couple of other riders who we will criss-cross during the morning reach us. They were still within sight ahead as Petrusville came into view and T, mistakenly thinking the guy riding behind him was me, pushed on hard towards the town. Only as he reaches the first buildings does he realise that I’m now some considerable distance back. The outskirts of Petrusville are rubbish strewn, and the road severely corrugated. Once in town it does occur to me that maybe we should grab some supplies, but we haven’t been on the road long and it seems a waste of time. Had either of us kept a copy of the sheet with WP distances we might have changed that decision. My estimate of the next stop turns out to be woefully short of the actual distance. Even more foolishly, once back on fastdistrict road I push too hard along a long, straight, wind assisted stretch. It feels great at the time to be flying along, but I knew it was a mistake. Sure enough, further along the road I had to pull over and regather myself in the shade of a cluster of largely disused farm buildings. My chain got some lube, my blistering lips some suncream, and my tummy got a muesli bar, but none of these really made me feel much better along the next section. It was long, hard, hot riding. Technically, this did have water, but nothing more. It seemed a little soon distance wise to be WP3, but was this it? A blue bakkie (pickup truck) pulled up and, in part, answered the mystery. This was one of the locations marked as a “tap” on the route sheet. Not an official stop but a place for clean water. Phew! Even better, the guys confirmed the actual WP was only 17km ahead. We’d be there in no time. Or so we thought. Renewed, the twisting rocky section actually becomes enjoyable, rising a little before swooping down into a valley – a delightful, fast, and scenic section surrounded by rocky outcrops. The rocky section turned out to be short, once down from the koppie (hillock) we roll out onto hard packed mud track across grassland, with deep wheel ruts that alternate each side of the middle hump. We enjoy some VIP treatment as our arrival at the first couple of gates timed perfectly with one of the guys from the blue bakkie opening up. A short final section of dirt track threads between a narrow avenue of date palms, leading back onto district road. On distance, this should be the last section before the WP. On and on we ride, checking every farm building along the way. Many, like a number we had already passed, are once grand dwellings now derelict and disused. It was a little sad to see – changing lifestyles maybe, or perhaps the land and farming is now just too harsh after years of heavy grazing. Eventually, with absolutely nothing in sight but more low shrubs, we began to doubt whether we had missed something. Or perhaps the chaps in the blue bakkie were mistaken, maybe that fridge was Andrew’s isolated WP. We rode on, bodies weary, shoulders slumping in the heat. Until, at last, we saw it. A gate with a small Munga board mounted on it. The purple line on the GPS screen confirms it – this was our turnoff and, after a short round about loop, there they were again. That most welcome of Munga sights – those fluttering flags signifying food, drink, and some much welcomed time off the bike. That’ll be one of my lasting impressions of WP3 – tasty vetkoek filled with savoury mince. But to mention that alone doesn’t really do WP3 justice. 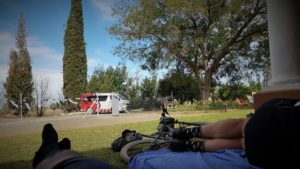 After the long dry road, it’s a positive oasis – lush green lawns, riders laying around relaxing under the shade of tall trees, even a couple of mattresses which some lucky riders arriving before us have already managed to bag. Our host barely lets us get up to help ourselves to refills. He busily brings us whatever we need, at the same time he’s also relocating the food and drink tables away from the house which is now in full sun to an area shaded under trees. There’s an offer of a dip in the pool too, but all of us are more interested in either eating or lying down for a few moments. 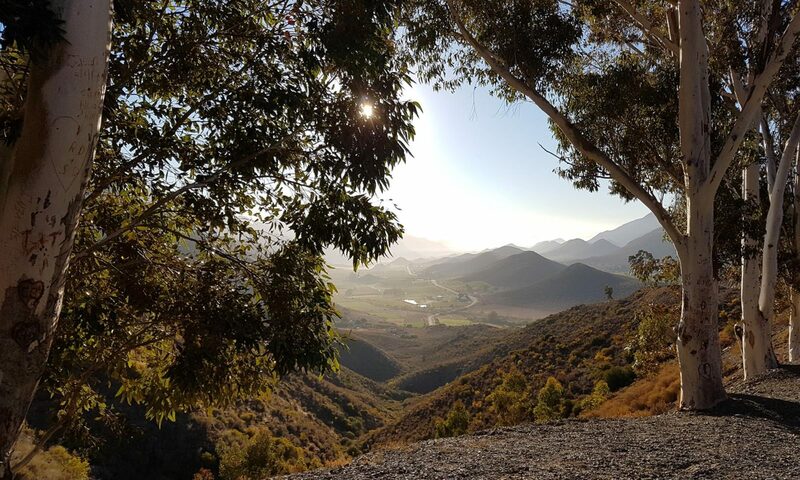 I try messaging Yoli, but we’re now deep in the heart of the Karoo and there is zero cellphone signal – something which will clearly be a feature of the next few days crossing this wild, remote landscape. On arrival we met up with Richard Baufeldt who was now readying to leave. The group of riders that had been just ahead of us are also kitting up to roll out. After checking with T that he’s happy to stay a while longer, I grab my chance and install my weary body on one of the now vacant mattresses. As a precaution I set my watch alarm for 45 minutes time. I do actually managed to doze off in the refreshing coolness of the lovely shade, but a hacking cough wakes me up well before the watch gets a chance to. One of the ER24 medics casts a worrying glance my way and asks if I want them to check me out. It’s impossible not to think of Peter Muller being forcibly withdrawn from PBP in 2015, and wonder if accepting the offer risks a similar fate. But I know health and family come first, and it’d silly this far from any other help to take chances. In moments, a blood pressure strap is on my arm, a heart monitor on one finger, and I’m doing deep breathing exercises as they listen to my chest. “Yep, you’ve got the start of what sounds like Bronchitis”, comments the medic. My heart immediately sinks at what might be coming next, but it’s not the news I’m fearing. I confirm that I do, and that I had a full stress ECG as part of my pre-race medical, so I’m confident there’s no underlying heart condition. The medic seems satisfied with my answer. It’s a total shift of mind-set from the medics on any other ride I have been on. Every ride medic is of course looking after our safety first and foremost. But the directive on many rides seems to be to try and eliminate any and all possible risk (and presumably liability). The guys here seem to understand that Munga is different, and tough, and that if everyone was pulled off the ride for every emerging medical condition there’d be almost no one left out their riding. It’s a very grown up attitude to discuss and explain the scenario with the rider, assess the risk level, and give the rider the information needed to make their own decisions. I’m absolutely certain that if they saw a significant risk, or were not comfortable with my understanding of the condition, that they would have stepped in to make the call for me. But for now, I get to breathe easily – well as easily as the occasional hacking cough allows! Body checked over, bottles refilled, and another clean farmhouse toilet sadly and embarrassingly defiled it is time to ride out. It’s past midday and even though it’s masked by the breeze, there is nowhere to hide from the afternoon heat. It’s only around 100km to RV2 (Britstown), and WP4 is halfway between. 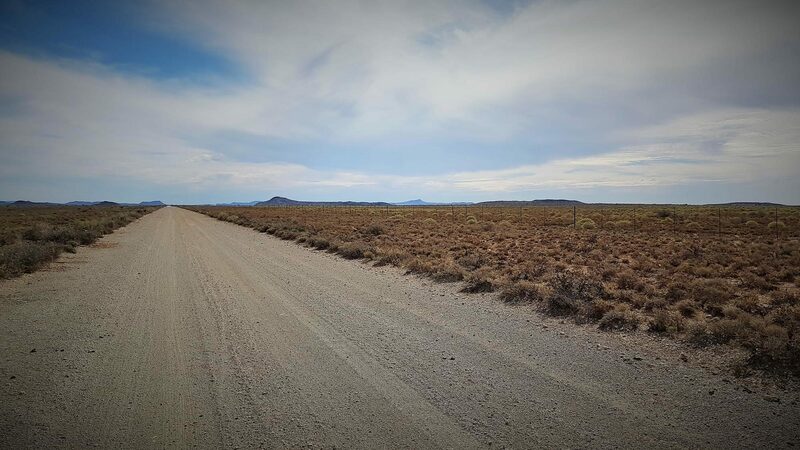 But even though the distances feel manageable, it’s going to be a long slog into the energy sapping furnace of the Karoo on a cloudless summer’s day. 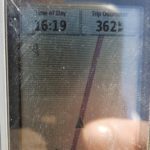 My recollection of the next section of the ride is extremely vague – lost in the dust, heat and fatigue. The minimal sleep at RV1, and the accumulated distance and time on the bike are beginning to weigh heavily on me making each pedal stroke laboured and heavy. I’m beginning to stand as much as sit, which is exacting a price – the balls and arches of my feet are excruciating, and my toes feel cramped and crushed. The route turns us right, and then right again by a small group of houses next to a railway line. I shout ahead to T to stop for a moment. The thought has struck me that I have still have two sets of footbeds in my shoes, and removing one could just be the relief I need. Hopping around in the gravel, trying to avoid getting stones in my socks and shoes, I quickly pull out the surplus and get T to stash the narrow strips of foam in my Camelbak. My feet are swollen now with the heat of the day, but tomorrow morning it could be a very different story and I might need them back again. Setting out again, we swing left over the railway and fork off onto another smaller district road. The pain is gone almost immediately. It takes a couple of tweaks on the Boa dial to tighten the shoes enough to stop my heel slipping, but there’s no loss of circulation in doing so. Funnily enough, no sooner than the standing pain in my feet is gone than I feel myself comfortable enough to sit and pedal again. This added level of comfort to the body could not have been better timed, because the road we are now riding is terrible. We alternate from corrugations to sketchy sand and back again, but nowhere is the pedalling free or easy. Worse still, we’re now ploughing almost direct into an annoying, if not actually strong headwind. I feel my head dropping and spend long periods just staring at the light grey, almost white of the dirt road ahead, barely able to take in the scenery around. Every pedal stroke that takes us forward seems to also rob me of energy, sending my spirits backwards. I can sense the jaws of that invisible Karoo Beast behind us. Except it’s not really behind us at all in a physical sense. It’s an abys within us, luring us to just give up and fall in. Honestly, why bother battling on against this, why not just sit down and let the car collect us and the struggle? I’m used to long rides where mental strength becomes more important than the purely physical, but this is something beyond and deeper than that. Even mental strength is not going to be enough out here – this ride is going to force us to find places deep down in our spirit to resist the urge to give in. Alex’s words come back to me ‘be still, and he will find you“. I’m not used to taking any kind of religious instruction, but in this case it’s exactly the thing I need. I try and quiet my mind and empty it of all thoughts. My job at this moment is to just turn the pedals. Anything else is counterproductive here – especially thinking. The road swings left through another farm – this one not deserted, but active and with farmworkers and their children stood by the road waving and cheering as we slowly grind through. The track pitches up slightly, and then undulates, it’s surface now more stony track than district road. One of the ER24 ambulances passes us, calling out to check we are OK as they do. A handful of kilometres down the road we see them again, parked up at the waterpoint. Those welcome fluttering flags greet us at a kink in the road around the farmhouse hosting us. The waterpoint is a proper family farm affair. An older daughter (I assume) is dot watching on her phone and asks which of us is Theunis and which Rob. Being greeted by name just adds to the warmth of the greeting and hospitality. A younger son is helping Ma and Ouma at the table of what are clearly homemade treats, laid out in well used and loved tupperware containers. And what an array it is: neat squares of Lasagne; frikadells (meat balls), cheese grillers, dadel balletjies (date balls), cake, and many other things I have forgotten. One other thing I do remember is homemade chocolate milk (Neskwik) in re-cycled soda bottles, It’s cold and refreshing, but half a bottle is all I can manage. The ER24 medics that passed us on the road are also refueling, as are a handful of other riders. None seem keen to ride out into the now oppressive heat of the mid-afternoon. T heads for a mattress to grab a few minutes – one of the farmhouse ladies instantly gets him pillows and a blanket to cover the bare mattress. I join him, but despite being shattered my eyes just won’t close and sleep. I lie there staring out through my toes. The immediate lush green of the farmhouse gives way just meters beyond the fence to the shimmering heat and harsh dusty landscape that surrounds this oasis. I’m restless – my body needs proper sleep, and the next RV is only about 50km further on. I want to get there and rest fully, eventually manage to nag T out of his slumber. We inch our way slowly towards the lumpy outline of a hilly horizon. It’s actually a relief as we being to reach it and the track starts to dip down and rise up around each small koppie (hill). The variety of terrain and scenery this brings, and the occasional patches of green around streams, are a welcome relief to the senses, not to mention the slight drop in temperature which arrives with the lengthening shadows. Cresting the last rise there’s a sudden and tangible sense of progress – a few houses are ahead and we swing left onto the gravel of a district road once more. For the last few kilometres we’ve altered our usual pattern at my request – we’ve been riding with me in front, or side by side. The sight of T pulling further and further away was gradually killing my already ebbing spirit. But now, with maybe 15km to Britstown and the RV, my energy is rising again. Or maybe the energy gel I found in my backpack an hour or so back has started to kick in. I almost never use gels but I was desperate for something to inject a burst of life into me. As we roll towards the tar of the N10 and signs of civilization begin to appear a realisation slowly dawns on me. My fueling strategy has been fundamentally flawed. I’ve been using my normal Audax strategy of relying on solid food at each stop. But the gravel we are riding is way more demanding than an endurance road ride – the intensity is perhaps double or more. My body has been hopelessly under fueled and, coupled with my normal issues digesting food early in a ride, it’s a concrete explanation of why I’m battling to find the energy to ride. Right there and then, my Munga changes for the better. I resolve to take on board way more calories at each stop, but to also keep energy drink in at least one bottle to top up in between. The smooth tar of the N10 does not last long. As it begins to swing right, we turn off left onto a rough track over the railway line, and zig zag towards the town. The sand is deep at times, at least one short section of which sees me walking. But as dusk starts to fall, the track smooths out to a condition that even I manage to ride at a decent pace. A final couple of bends, with trash strewn shoulders signals our arrival on the outskirts of town. A couple of town dogs raise dirty, snarling snouts momentarily as we pass but instantly lose interest and bury them again in whatever piece of tasty garbage they were ferreting for. Abruptly, we spill out onto tar again, and turn left at a stop street a hundred meters or so ahead. In the fading light we roll up to welcoming frontage of the Trans Karoo Hotel. My spirits are considerably better than at RV1, although T is now beginning to fight his own battle with the energy and food demons. “and another clean farmhouse toilet sadly and embarrassingly defiled” – love your work. Looking forward to the next installment. You have a gift enabling the reader to live the moment. Can’t wait to ride along the next installment.